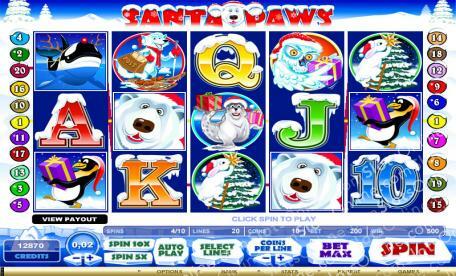 It is Christmas all year round at this festively fun slot. Click here to play! No need to wait for Santa Claus to drop off your presents because you can win yourself a chimney full of incredible cash payouts. Santa Paws is a colorful 5-reel slot played across 20 pay lines, and whenever you win on a spin, you are given the opportunity to double or quadruple your winnings via the Gamble option. The Santa Paws symbol is Wild and can become any other symbol on the reels except Scatters. If you manage five on an active pay line you will be rewarded with up to 4000 times your initial wager! The Penguin is Scattered and will trigger the Free Spins feature when three or more appear on the reels. Once inside you can win up to 12 free spins, and Rudolph acts as the Wild Substitute. Jingle all the way down to this exciting slot for your chance to take home the jackpot! The Penguin is Scattered and activates the Free Spins feature when three or more appear on the reels. Once inside, Rudolph becomes Wild. Santa Paws is Wild and can be subbed for any other symbol except Scatters. It also pays out up to 4000 coins. When the Free Spins feature is triggered, Rudolph becomes Wild.